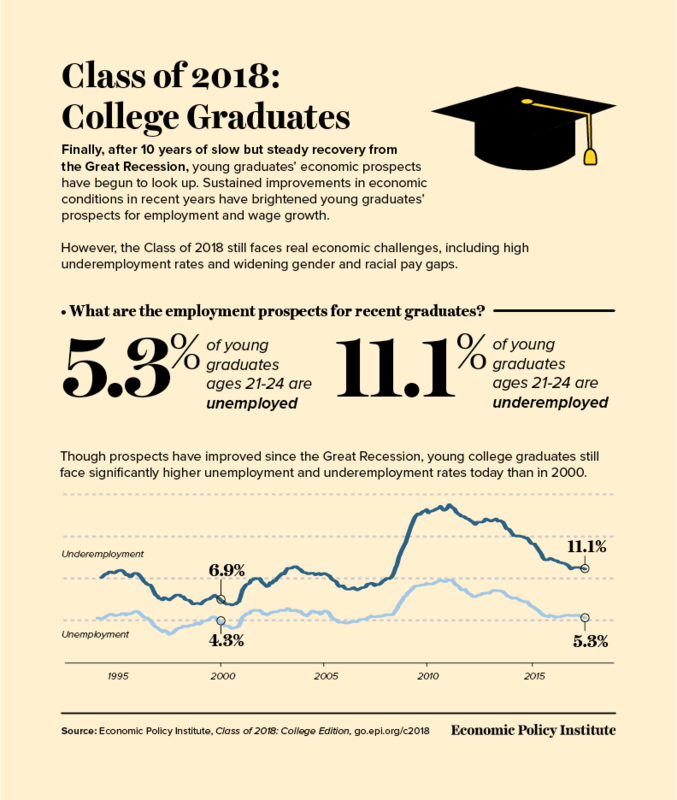 After ten years of slow but steady recovery, young college graduates’ economic prospects continue to look up. However, compared with those who graduated in the tight labor market of 2000, the class of 2018 still faces real economic challenges—as demonstrated by elevated levels of underemployment as well as worsened wage gaps, particularly for women and black workers. Click here to share this graphic, which shows that while 2018 college graduates have better job prospects than the classes of 2009 through 2017, young people entering the job market continue to face real economic challenges. In EPI’s Class of 2018: College edition our economists and researchers provide in-depth analysis of the labor market for young graduates. While by many measures the labor market for young college graduates is now almost or fully back to where it was before the recession, we should be striving for a stronger labor market than 2007. We should instead be striving for the high-pressure economy of the late 1990s and 2000, in which an extended period of labor market strength translated into better opportunities for workers across the board. In 2000 as well as for much of the late 1990s, the hourly pay of black college graduates closely tracked that of their white counterparts. Black wages saw large declines in the Great Recession and its aftermath, translating into lower wages and significantly larger pay penalties right out of college. Today, young black college graduates face a 16.8 percent pay penalty compared with their white counterparts. Between 1990 and 2018, average wages of young college graduates grew only 15.5 percent in total—if it hadn’t been for the tight labor market of the late 1990s and 2000, wages would be no higher today than in 1990. Because men’s wages have risen while women’s have barely budged between 2000 and 2018, the gender wage gap for young college graduates has grown over the last 18 years from a pay penalty of 11.0 percent to 14.7 percent. Click here to read the full report, Class of 2018: College edition. There is still much more to do to ensure that young people enter a job market that allows them to reach their full potential.